Fitting and adjusting your helmet. We’ve prepared a fact sheet (linked above and below) to help you to chose, fit and adjust your helmet, or to help children with doing the same for theirs. Remember that a helmet is only meant to be a last resort for safety. It does not replace safe riding skills or supervision where necessary. Wear a helmet, but ride as though you weren’t wearing one. A: During a fall or a collision, the head can accelerate quickly toward the ground. If the helmet isn’t adjusted properly, it can come away from the head. Even a slight separation can dramatically reduce the protection the helmet can provide. If the helmet hasn’t been cared for properly, it’s not possible to ensure that it will provide the protection needed in a serious impact. A poorly-adjusted or damaged helmet might provide some protection. But will it be enough? Need assistance with any information in the fact sheet? Ask staff at your local bike shop for tips, or sign up for a cycling course. This information is available in PDF format. Please feel free to distribute this document as you please, provided that it is reproduced in its entirety—logos and CCE contact information may not be omitted. The materials are © 2010, The Center for Cycling Education. A helmet is only meant to be a last resort for safety. It does not replace safe riding skills, a safe bike, and supervision where necessary. Wear a helmet, but ride as though you weren’t wearing one. A poorly-adjusted or damaged helmet might provide some protection, but will it be enough? If you let your child pick out his or her helmet, there’s a much greater likelihood that it will be worn. The helmet must fit now, and not be ‘grown into’. Be sure it is worn always, and ensure that you are a good role model for your child/ren (and others) by wearing your helmet each time you ride. Price isn’t the best indicator of safety. Higher-priced helmets generally weigh less, have more ventilation, and a more easily-adjusted/comfortable strap system, but aren’t necessarily safer. Avoid buying or using a skateboard-style helmet. Their straps angle in from the edge of the helmet, rather than lying flat against the face. 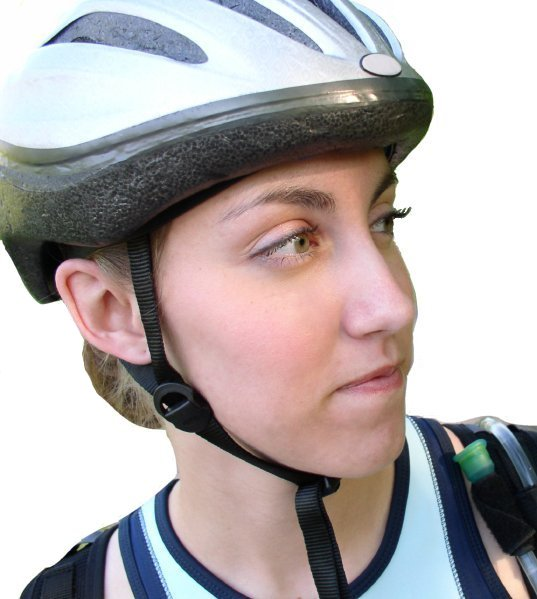 These strap systems do not allow proper tightening, and the helmets are designed for different impacts than those usually encountered while cycling. Also, avoid buying a full-face helmet if the rider will be riding on roads or pathways. Most models restrict vision and hearing, are quite heavy, and have little ventilation. Don’t accept a used helmet for you or for your child, or give an old helmet away. If it’s not safe for you or your child, it’s not fit for anyone else to wear. Hold the helmet upside down, with the front (visor) facing towards you. Hold the straps in place with your thumbs. Put the helmet on and make sure its level. — Most helmets have an adjusting mechanism at the back (i.e., at the top of the neck); this may need to be loosened or tightened to make a proper fit before going on to the next steps. — Grasp the top of the helmet and gently twist side to side to be sure it’s snug enough. — If it’s too loose, it either needs padding added (one layer only), or is too large. — Next, try putting a finger between the helmet and your forehead; there shouldn’t be any more space than the width of a finger tip. If there’s too much space, the helmet is too large. — If the inside of the helmet doesn’t come down close to the scalp, or pinches, it’s too small. Adjust the straps to make sure they are lying flat against your face. The straps should form a ‘V’ around the ears, with the clasps coming just below the ear lobes. — If the clasps or sliders are too high or low, move them to the proper position. Buckle up the strap; when it’s done up, it should rest against the underside of the chin. 1) The helmet should be level, with only one or two fingers’ width between the eyebrows and the helmet. It should fit snugly, but not be tight. 2) The chin strap should lie flush against the chin, and be snug enough that only one or two fingers could be inserted under the strap. 3) The clasps should be just below the ears. Solution: Tighten the back straps (the ones behind the ears). Solution: Tighten the front straps (the ones in front of the ears). Situation: With straps undone, helmet rocks side to side, or turns more than an inch to either side when twisted gently from the top. Solution: This indicates that the helmet is too big. A properly fitting helmet must be chosen. Replace your helmet every three to five years, or after it has been in an impact (either from a collision, or from falling from any height, such as from a shelf). Children’s helmets should be replaced more often, as they get outgrown and are generally subject to more damage through handling.